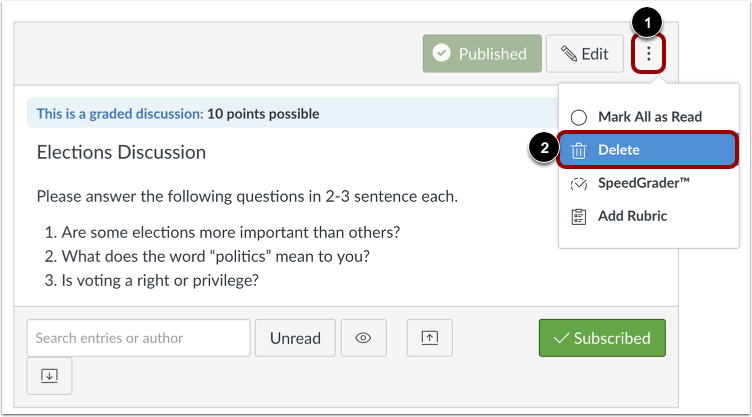 You can delete a discussion or graded discussion at any time. Note: When Multiple Grading Periods are enabled in a course, graded discussions are not currently validated against closed grading periods. Deleting a graded discussion may affect the total grade for students in your course. 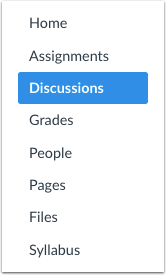 In Course Navigation, click the Discussions link. There are two ways to delete a discussion topic. To delete a discussion from the index page, locate the discussion. Click the Options icon  and click the Delete link . To delete a discussion individually, click the title of the discussion. Click the Options icon , then click the Delete link . Previous Topic:How do I subscribe to a discussion as an instructor? Next Topic:How do I enable a podcast feed for a discussion in a course? Table of Contents > Discussions > How do I delete a discussion in a course?